I started by mixing 3 eggs with 60g of caster sugar and a packet of vanilla sugar until very creamy and fluffy. I also added some lemon flavoring to the mixture, but feel free to add orange or vanilla extract just as you wish (the cake will taste great without flavorings as well). Assemble the lamb baking pan and butter it so the lamb will not stick to it. Pour the batter into the form and let it bake for 40 minutes at 180°C. Let it rest in the form for 5 minutes before transferring it onto a wire to cool completely. 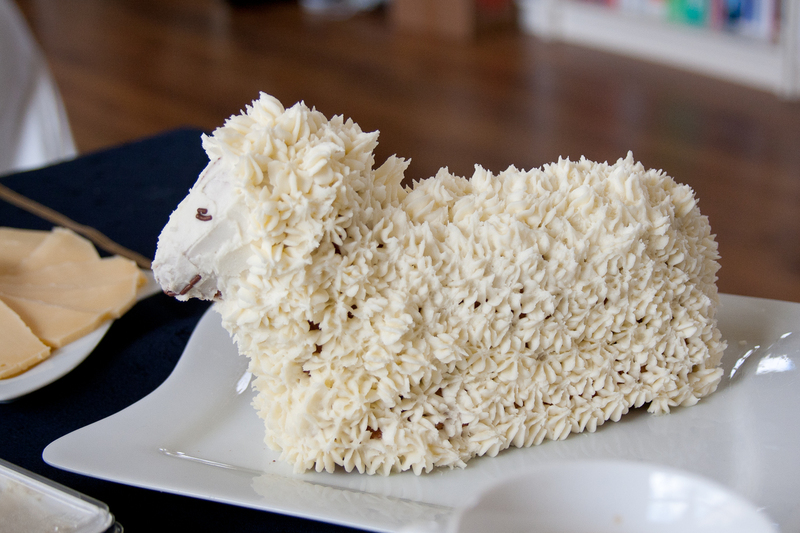 When the lamb has cooled completely, I have iced the face of the lamb smoothly and added little rosettes on the whole body of lamb (just by using a regular piping bag with a rosette tip). For the eyes and the mouth I used little chocolate sprinkles, but feel free to use whatever you like 😀 And well, that’s it! It took me about 10-15 minutes to ice the whole lamb, so it really isn’t that big a deal.